The past few weeks has seen big robocar news. Real news — not the constant “X is partnering with Y” press releases that fill the airwaves sometimes. 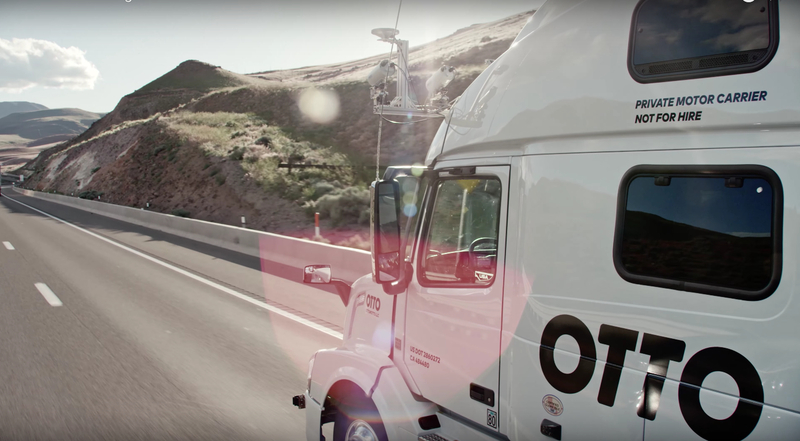 Uber has made a deal to purchase Otto, a self-driving truck company I wrote about earlier, founded by several friends of mine from Google. The rumoured terms of the deal are astronomical — possibly 1% of Uber’s highly valued stock (which means almost $700M) and other performance rewards. I have no other information yet on the terms, but it’s safe to say Otto was just getting started with ambitious goals and would not have sold for less than an impressive amount. For a company only six months old, the rumoured terms surpass even the amazing valuation stories of Cruise and Zoox. While Otto has been working on self-driving technology for trucks, any such technology can also move into cars. Uber already has an active lab in Pittsburgh, but up to now has not been involved in long-haul trucking (it does do local deliveries in some places). There are many startups calling themselves the “Uber for Trucks” and Otto has revealed it was also working on shipping management platform tools, so this will strike some fear into those startups. Because of my friendship with Otto’s team, I will do more commentary when details become public. In other Uber news, Uber has announced it will sell randomly assigned Uber rides in their self-driving vehicles in Pittsburgh. If your ride request is picked at random (and because it’s in the right place) Uber will send one of their own cars to drive you on your ride, and will make the ride free to boot. Of course, there will be an Uber safety driver in the vehicle monitoring it, ready to take over in any problem or complex situation. So the rides are a gimmick to some extent, but if they were not free, it would be a sign of another way to get customers to pay for the cost of testing and verifying self-driving cars. The free rides, however, will probably cause more people to take Uber rides hoping they will win the lottery and get not simply the free ride, but the self-driving ride. GM announced a similar program for Lyft — but not until next year. Ford announced it wants to commit to making unmanned capable taxi vehicles, the same thing Uber, Google, Cruise/GM, Zoox and most non-car companies want to make. For many years I have outlined the difference between the usual car company approaches, which are evolutionary and involve taking cars and improving their computers and the approaches of the non-car companies which bypass all legacy thinking (mostly around ADAS) to go directly to the final target. I call that “taking a computer and putting wheels on it.” It’s a big and bold move for Ford to switch to the other camp and a good sign for them. They have said they will have a fleet of such vehicles as soon as 2021. Other companies have announced plans to go for unmanned capable taxi vehicles, particularly Daimler and BMW, but they still maintain active “evolutionary” projects which hope to build on their prior ADAS work. The other big news is that Ford, together with Baidu, have made a $150M investment in Velodyne. Velodyne has been for a decade the primary supplier of LIDARs for robocar research projects, but their LIDARs are research instruments: high performance at high cost. In the meantime, other companies (such as Quanergy, for whom I am an advisor) have been pushing to make better-priced LIDARs for real production. The Velodynes have been the right choice because it is smart to research with what’s expensive today, knowing it will get cheap in the future. Baidu’s test cars have had Velodyne’s on them, but there were recent rumours of Baidu experimenting with alternatives to LIDAR, but this investment may counter those rumours. This investment will move Velodyne to a lower cost production unit, though at present at a higher cost than the solid-state plans of Quanergy and some others. Otto included a few people from Google’s car team. It was also recently revealed that Chris Urmson, who had run the team for most of its existence and was moved to “CTO” after the arrival of John Krafcik, has departed. I worked for Chris, but he has not told me his reason for departure. In general Google’s car team has gotten huge, and the recently departed people are mostly folks who were among the first 20 on the team. This may simply be a sign of massive expansion, I have not heard much to credit the idea that there is some sort of internal chaos. In addition, deals like the Otto deal will certainly cause people to consider if they want to work for a big corporation or break out on their own. A few weeks ago, MobilEye issued a press release that they would not be supplying the next generation of their EyeQ chips to Tesla. The EyeQ4 is a great deal more sophisticated than the EyeQ3 that Telsa uses and Tesla even uses an older version with a more limited set of features — including, most famously, the inability to detect things like cross traffic. Since MobilEye announced it, it seems like it was their decision (you don’t usually issue a press release to say you have been dumped by a smaller customer.) It caused their stock to take a quick big hit (disclaimer, I own a small amount) on the day of the announcement, but it recovered reasonably well. Tesla’s stock was not affected. Tesla folks have always claimed that they only made minimal use of ME’s functionality and that the real special sauce was theirs. ME folks have claimed the opposite. This break-up will settle that question, and presumably, Tesla has been working on alternatives for a while as they don’t seem to be in much panic about it. Tesla has made announcements of plans for their new hardware and those plans look very similar to the EyeQ4, so they must have had their own parallel research underway.